The personification of death has been a part of human storytelling for millennia, helping people come to terms with this inevitable part of existence by giving it a form and face, even if it’s just a skeleton and bare skull. 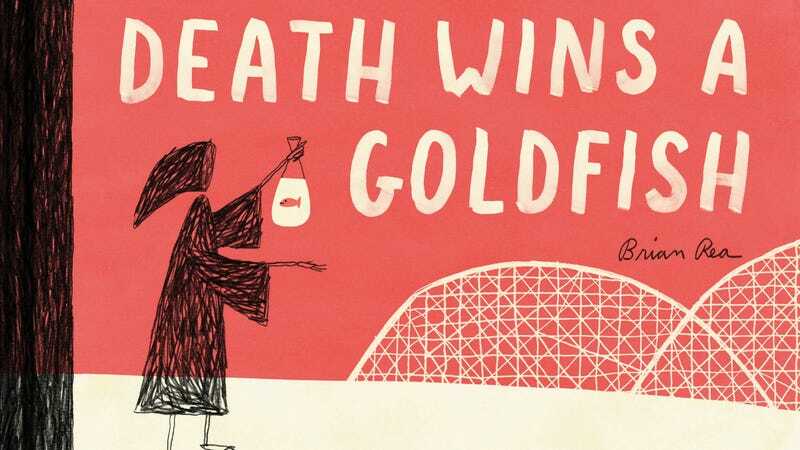 In his new book, Death Wins A Goldfish (Chronicle), Brian Rea carries on this tradition by presenting Death as the ultimate workaholic forced to use all of its accumulated days of paid time off, amounting to just under a year of freedom. In Rea’s story, work is death, keeping people from enjoying their lives by forcing them into routines where productivity is far more important than satisfaction. Last month, a BuzzFeed article, “How Millennials Became The Burnout Generation,” ignited conversations about how that generation has internalized the idea that it should be working all the time. Rea’s interpretation of Death reads like the embodiment of this concept. When forced to take its PTO days, Death is in a position where it not only has to fill empty hours, but find gratification in activities that are in no way tied to occupational advancement. Death is overwhelmed by the possibilities—depicted in a crowded page of bubbles containing different activities, which also serves as the book’s endpapers—but is committed to getting outside of its comfort zone and living in a world that it typically only engages with by taking people out of it. There’s a lot of sweetness in Death’s global journey, and while the character never speaks, Rea welcomes readers into its thoughts through journal entries, which show how Death gradually become more amiable and adventurous as it engages with new people, visits new places, and discovers new passions. A former New York Times’ art director and illustrator of the newspaper’s “Modern Love” essays, Rea has a talent for capturing deep emotions in loose drawings, using bright colors and strong graphic composition to convey the expressions of a character whose face is a gray circle. The first image condenses all of Death’s infinite work experience by showing the reaper in front of two walls covered in slash marks representing each dead person. Unlike its colleagues, whose cubicles have contained boxes of slashes, Death’s walls have no ceiling, towering high above to shrink the protagonist under the weight of its work. 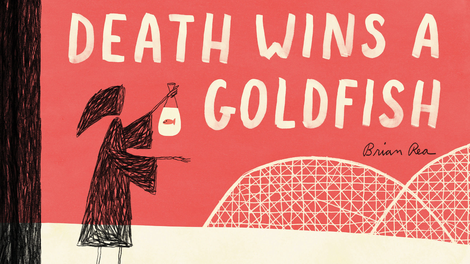 Death Wins A Goldfish is more like an adult picture book than a traditional graphic novel, with most pages containing a single illustration, text from Death’s journal, or a combination of both. Rea occasionally makes use of the two-page spread to give extra emphasis to certain visuals, like Death in a cubicle-structured office full of grim reapers, riding a roller coaster at a carnival, or relaxing on a beach. Death pointing at things is an iconic image that typically comes with ominous connotations, but Rea uses it for comedic sequences like Death ordering from a Starbucks menu and getting a cup with “Beth” and a smiley face drawn on it. This is a quick, breezy read, but Rea packs a lot of substance into Death’s experience, highlight the challenges of breaking out of the burnout mentality and the joys of taking time to engage with life without thinking about work.